The nature sanctuary is closed. The government has screwed him royally. Why is Mr. Allard still investing money in Barbados? I have asked on the Facebook group what is the physical state of GHNS at the moment, and are there regular (e.g. daily) reports on its condition? the last I heard was that some illegal fishing had been going on, and the RBPF did not respond quickly at the time. Have they responded since? Just what is going on in there (physically) I would like to know. Sam Lord’s Castle soon became derelict, pilferred, and seriously damaged internally. Coconut palms were sawn down, etc. I am beginning to despair at some aspects of Barbadian concern (or rather the lack of it). I too would like to see a report andphotos of the sanctuary as it is. Are the fish gone from the swamp? Take a good look at that photo. 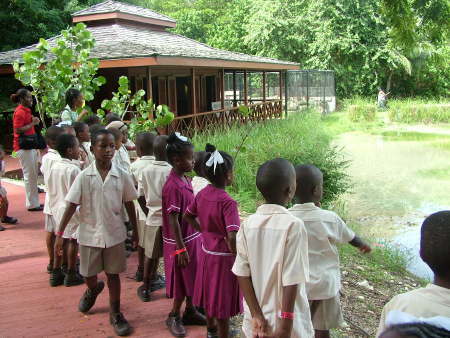 Look at the building, the walkway, the perfectness of the place and the children seeing something you can’t see anywhere else in Barbados. One man spent millions to make that happen and the govmnt treated him like dirt. Lord knows why he loves Barbados still. I read this a second time and realized that this $2k award is being handed out four times a year. I misunderstood at first and thought it was a one time shot. This could result in a lot of interest from our young people. What happend to the million dollars the government gave to the Graeme Hall Nature Sanctuary? How was it spend? Just like the promise of a ministerial code, ITAL, FOI and the million dollars to Graeme Hall, its all make believe and pure fiction shovelled by a compliant press to keep Barbadians from smelling the stench of sweet nothing for their money and votes.